↑ "Cheetah". Merriam-Webster Dictionary. Retrieved 12 February 2016. ↑ "Cheetah". Oxford Dictionaries. Oxford University Press. Retrieved 22 March 2016. ↑ Werdelin, L.; Yamaguchi, N.; Johnson, W.E. ; O'Brien, S.J. (2010). 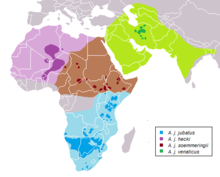 "Phylogeny and evolution of cats (Felidae)". In Macdonald, D.W.; Loveridge, A.J. Biology and Conservation of Wild Felids (PDF) (Reprinted ed.). Oxford, UK: Oxford University Press. pp. 59–82. ISBN 978-0-19-923445-5. ↑ Sunquist, F.; Sunquist, M. (2002). Wild Cats of the World. Chicago, USA: The University of Chicago Press. pp. 14–36. ISBN 978-0-226-77999-7. ↑ Adams, D.B. (1979). 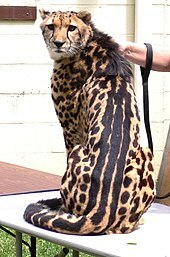 "The Cheetah: Native American". Science. 205 (4411): 1155–8. doi:10.1126/science.205.4411.1155. PMID 17735054. ↑ Leakey, L.S.B. ; Hopwood, A.T. (1951). Olduvai Gorge: A Report on the Evolution of the Hand-axe Culture in Beds I-IV. Cambridge, UK: Cambridge University Press. pp. 20–5.